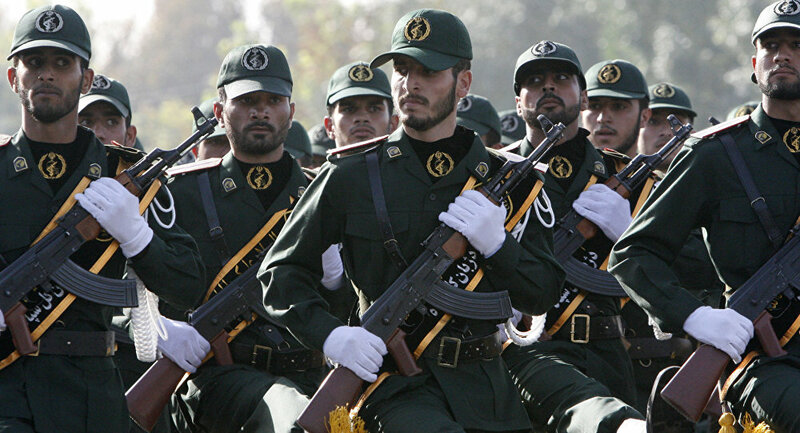 Previously, Iran's elite force, the Islamic Revolutionary Guard Corps, vowed to teach the US "new lessons" if sanctioned. The US Treasury Department has announced the expansion of sanctions on Iran's Revolutionary Guards, which were imposed on October 13 over IRGC allegedly "supporting terrorism," a claim strongly denied by Tehran. The sanctions affect the Revolutionary Guard's Aerospace Force Self Suffiency Jihad Organization, Air Force, Al-Ghadir Missile Command, and the Research and Self-Sufficiency Jihad Organization, according to the Treasury's press release. Moreover, the commander-in-chief of the IRGC has been also placed on the US sanctions list. Iran has pledged to "strongly respond to any action against its military forces," while the Revolutionary Guards commander, Mohammad Ali Jafari, vowed to equate US forces with Daesh terrorist group (ISIS, banned in Russia) before the sanctions were imposed. According to Iranian government spokesman Mohammad Baker, labelling the IRGC a "terrorist group" would mean Washington itself supports terrorists. Washington's decision to expand sanctions on Tehran come in the wake of US President Donald Trump's earlier decision not to certify Iran's compliance with the historic 2015 nuclear deal — also known as the Joint Comprehensive Plan of Action (JCPOA) — prompting strong opposition of Tehran and other powers that had brokered the agreement. Other members of the P5+1 group, including Russia and Germany, have confirmed Iran's adherence to its obligations under the nuclear deal. Most lately, International Atomic Energy Agency (IAEA) Director General Yukiya Amano has yet again reiterated the Islamic Republic's implementation of "the nuclear-related commitments." READ MORE: Scrapping Iran Nuclear Deal Will Be First Step to Future Wars — French Def. Min. While Trump has been hinting at possible US intention to withdraw from the Iran nuclear deal, US Secretary of State Rex Tillerson stated that Washington aims to fully enforce the agreement as it is and "then begin the process of addressing the flaws," emphasizing that the agreement is in the best interest of the United States. According to the JCPOA on Iran's nuclear program signed by Tehran and the P5+1 group of nations — a group comprised of the five permenant members of the UN Security Council — China, France, Russia, the United Kingdom, the United States plus Germany — on July 14, 2015, in Vienna, Tehran has pledged to limit its nuclear activities, placing it under international control.